David Nowlin (Caddo County Extn. Educator) sent in a wheat sample (Duster) exhibiting symptoms typical of wheat streak mosaic. If confirmed, this would be the second sample of WSM received from south central and southwestern OK.
Dr. Art Klatt (OSU Wheat Geneticist) has been this last week in Castroville, TX (far southern TX) rating breeder plots/lines for leaf and stripe rust. He has reported that, “In Castroville there is heavy leaf rust. We also found a little stripe rust but not enough to take readings and it was beginning to shut down due to temps. “ In Oklahoma, Dr. Klatt has reported seeing heavy powdery mildew in plots near Perkins, OK and at Stillwater, but has not yet seen any leaf or stripe rust. Monday, 15-Apr, I and Nathalia Grachet (OSU Graduate Student) did plot work at the variety trial near Apache, OK. Wheat there was approaching Feekes 10. Flags leaves were out, but for most tillers, heads had not yet moved into the boot. Freeze damage was the most striking symptoms in this trial and surrounding fields, but tan spot/septoria/stagonospora, powdery mildew, and barley yellow dwarf symptoms also could be found – but, no leaf or stripe rust. Today (17-Apr) I checked my trials and nurseries here at Stillwater. Wheat was at “pre” GS 10 with flag leaves fully out but the heads not yet fully moved into the boots. Even where the boot internode was fully expanded, the head was usually just beginning to move into the boot. I found powdery mildew low, but no rusts at Stillwater. 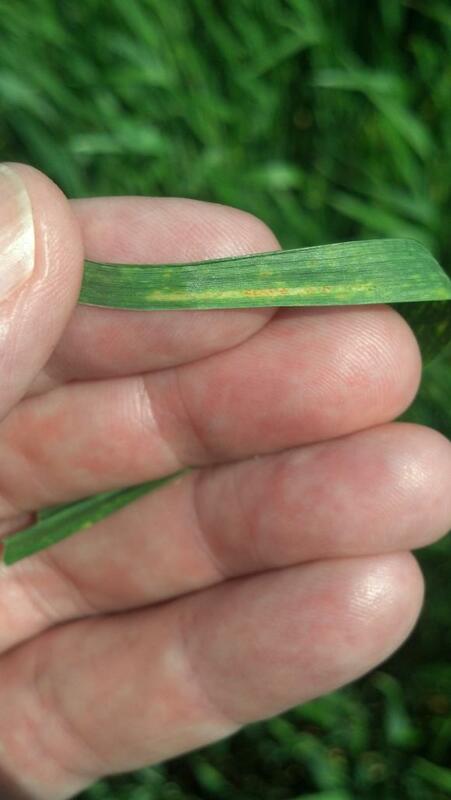 Spots indicative of BYDV have appeared. By osuwheat in Uncategorized on April 18, 2013 . Thanks Dr.Hunger but the vital question remains unanswered – Are the levels of disease being observed indicating that a fungicide application would be likely to produce a positive economic return? I fully understand that the specific answer depends on variety, growth stage, yield potential, etc and that each field of wheat has a unique answer. But these are specific fields being observed and you could certainly tell us whether the fields you are looking at would be helped by a fungicide. I appreciate the reports so that I know to get out and scout and what I should be looking for, but I’d also like to know if and where spraying thresholds are being reached. Thanks for the question. As you indicate, making a decision to spray is a process of evaluating many factors and often involves as much “art” as “science.” With most plant diseases, there are not thresholds for spraying as there is with insects. Hence, the decision to spray is made following the thought process you mentioned and as is described in OSU publication CR-7668. Higher wheat prices (>$6/bu) and the advent of less expensive but effective fungicides has made this decision easier as an application costing $8-10/acre only requires 1-2 bu/acre to recover fungicide and application cost. To determine actual economic gain, a non-sprayed control strip would need to be left, which most producers do not leave. Decades of fungicide testing at OSU and elsewhere has indicated an average of a 8-12% yield increase from applying a fungicide, which can vary from 0% to >30%. Regarding the specific fields I reported on near Apache – I’m confident that spraying was a good decision at the time as two weeks later I observed significantly less disease. However, the first hard freeze event in that area negated much of that benefit, particularly in one of the fields. Hence, I try to report disease situations where spraying should be considered, but can not provide disease thresholds for when to spray because there are so many other variables involved in making that decision. However, I can say with confidence that I have never found a producer that felt a fungicide application was wasted if yield potential was high (>30 bu/acre), if foliar disease was a major factor in the field, and if no other event such as a freeze, hail, etc, came into play that negated yield. I have more frequently encountered producers that wish they had sprayed, or if they did spray, wished they had sprayed a bit earlier. Please feel free to contact me if you would like to discuss further, or please do so on this blog as this is useful discussion. Thanks for the reply. I’m sure its about as much fun to try and answer my question as when my landowners ask me if they should sell or store every harvest! I happen to be blessed over here in Ottawa Co this year as our wheat is easily 50+ bu/ac potential. If nothing major hits between now and June, I’d say 70+ bu/ac will be pretty common. Flags are just starting to emerge, but we are so far behind on getting corn planted that any decent day I’ve spent on that task rather than scouting my wheat. I’d estimate well over 25% of the wheat acres up here are already booked to be sprayed for head scab even though I haven’t heard of any observed threat in this region. This isn’t a tentative booking…its set up to be automatically put down when the applicators see fields start to head. And every one of those fields have either already had a Feekes 10 fungicide application or will get one in the next week or so. This sort of practice (and the guys selling the fungicides seem to actively promote it) seems very counter-productive to me. I’m expecting to have effective fungicide control options for about 10 more years or less before resistance wins the battle. This latest rain will now give me a decent chance to walk out and do some decent scouting. I’ll keep you posted if I spot anything significant this direction.